I sit in the cosy, heated front room looking out at the grey light turning to dusk hours before the end of the afternoon. 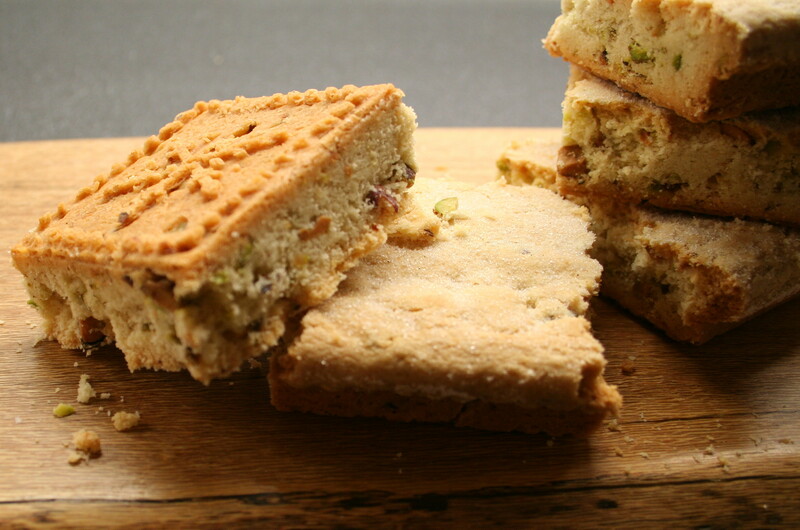 I can still faintly smell the sweetness of freshly baked shortbread coming from the kitchen, and in the winter bleakness cannot begin to imagine the dry heat that surrounded me the last time I had a square of melting shortbread. It was in December whilst road tripping in South Africa. At the end of a week of lazy days in the small Karoo town of Uniondale my Mom and I – with the intrepid fox terrier in tow – set off on the three-hour journey to Port Elizabeth to fetch my sister-in-law and nine-month-old nephew. The one thing Uniondale lacks – like so many small Karoo towns – is decent coffee, freshly percolated through fine roasted and ground espresso beans. It had been weeks since I’d had my usual morning cappuccino hit from one of the many coffee shops that lie between my apartment and work. The designated morning coffee stop that warm December morning was a small café called The Sweaty Dutchman in Kareedouw – a tiny excuse of a town in the fruit growing Langkloof valley. It was soon obvious why this one little café – with it’s disturbingly odd name – was the only place to stop along the upper reaches of the scenic R62 that winds along the Baviaanskloof mountains – and I have to add, it was not just the coffee. Resting against the aromatic cup of coffee swirled in thick steamed milk was a rather unassuming cube of shortbread. As I delicately bit the small cube in half it instantly started melting in my mouth – crumbly almond and vanilla dissolving into smooth buttery lightness – and all I wanted to do was rush to the counter and interrogate the decidedly unsweaty looking Dutchman for the recipe. Instead I sat quietly savouring it with sips of steaming caffeine bliss. I had to recreate it. 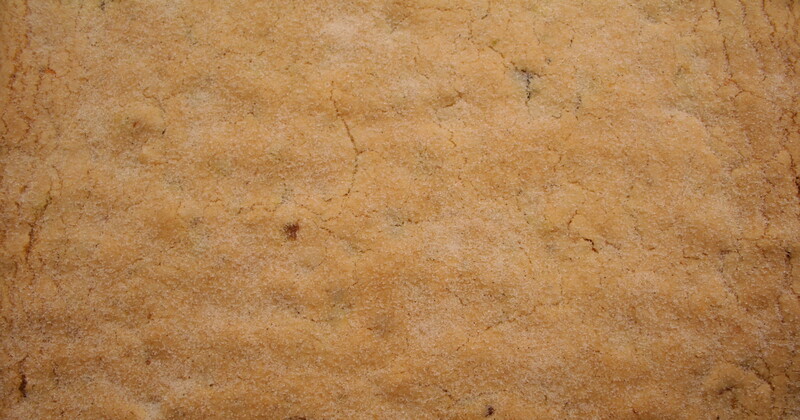 And so here, after some questioning and some experimentation, is my attempt at recreating Hans’s shortbread. Preheat the oven to 180°C (160°C for fan oven). 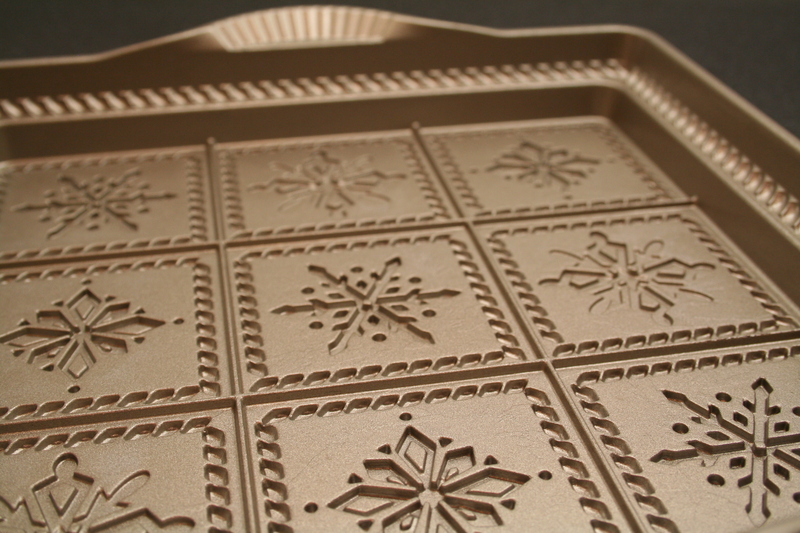 Butter a 20cm x 20cm shortbread tin or baking tray. This quantity will make shortbread that is about 5cm thick. 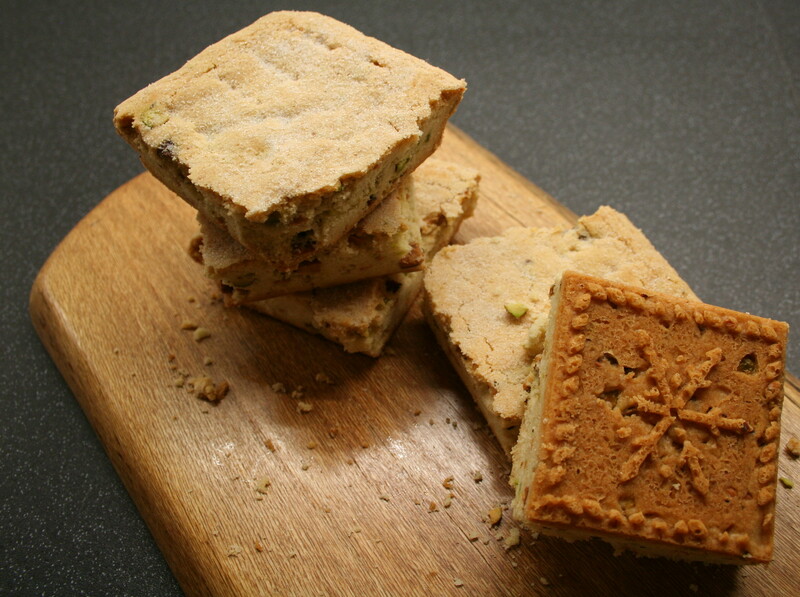 If you prefer thin shortbread either divide it and bake it in two batches or use a bigger baking tin. 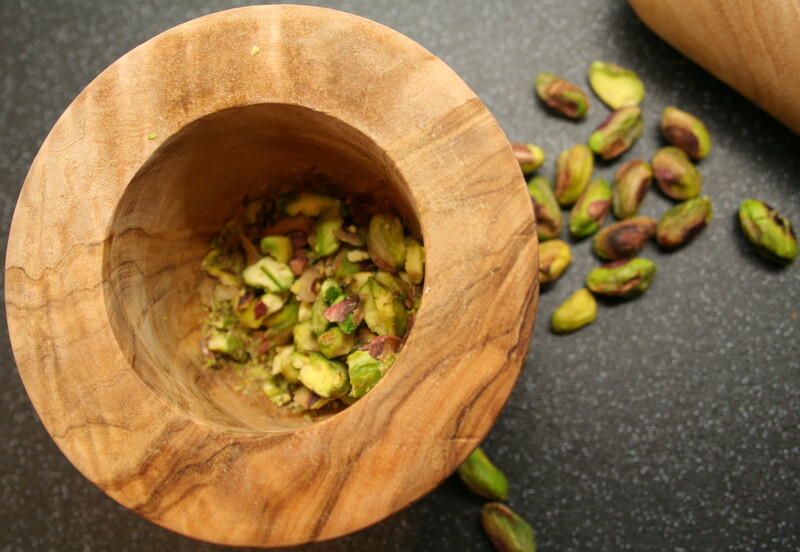 Using a pestle and mortar crush the pistachios. If you do not have one you can chop the nuts instead. Cream the butter and confectioners’ / icing sugar until light and fluffy. 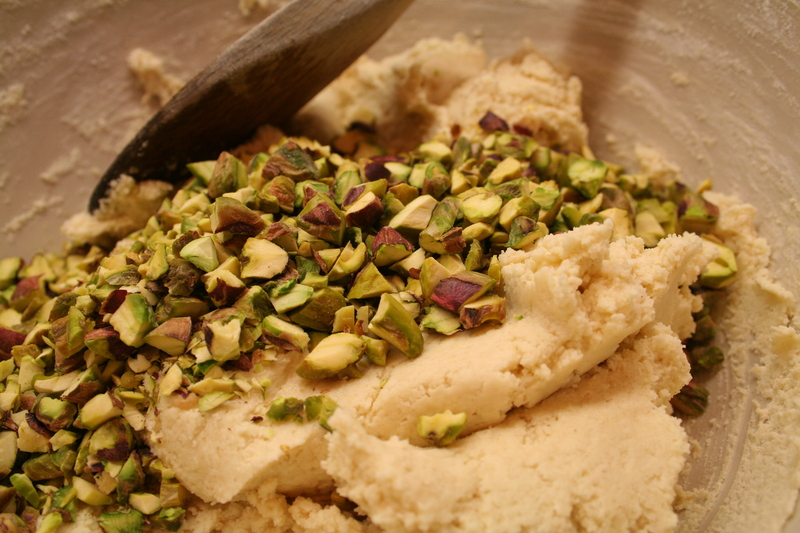 If using an electric mixer, first blend the butter and sugar with a spoon or you will be enveloped in a cloud of powdery sugar. Add the vanilla extract, almond extract and salt and blend well. 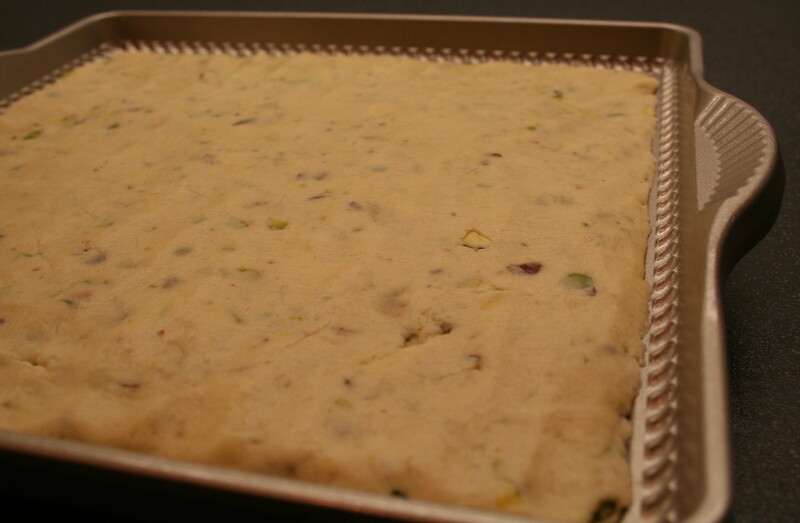 Reduce mixer speed and add the ground almonds, flour and mix until combined. 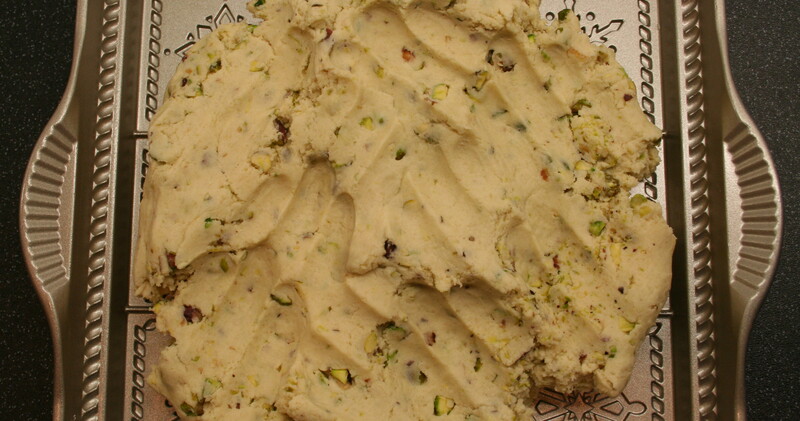 Add the crushed pistachios and work them into the dough. Work the dough into a ball and press into the baking pan. Cover with cling film and refrigerate for 20 minutes. Once chilled bake for 30-35 minutes until golden (if you decide to halve the dough and bake in two batches for thinner shortbread, you will need to reduce the baking time – watch the colour of the shortbread as a guide to when it is done). Remove from the oven and sprinkle with vanilla caster sugar while still hot. Allow to cool in the tin. 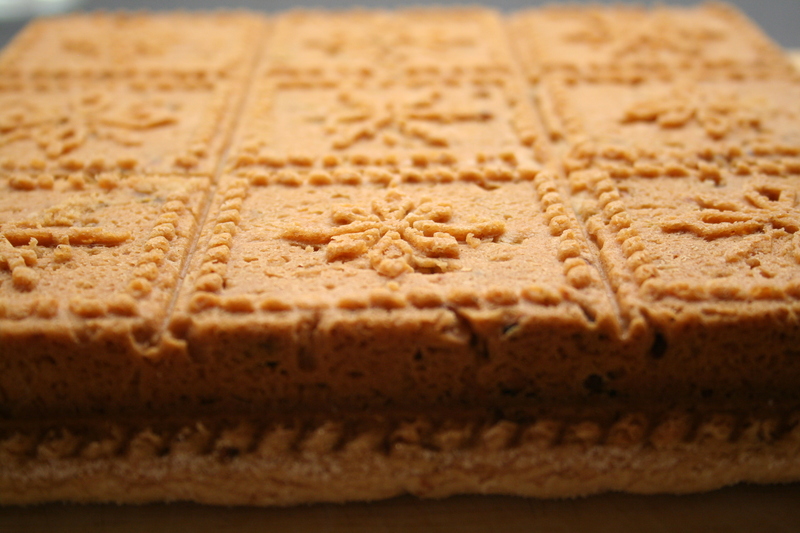 Depending on the tin you use, you can either cut the shortbread while still hot – to prevent it crumbling too badly once cooled – or you can wait until it is cold to either cut it or break it into pieces. 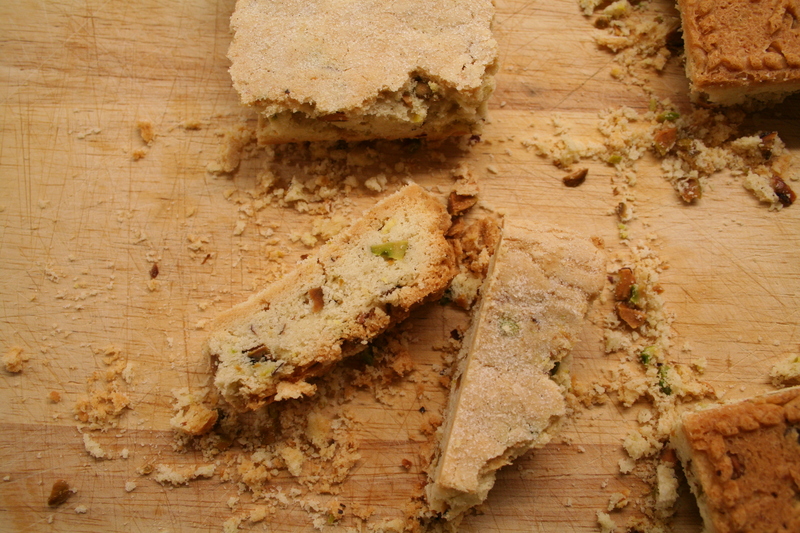 This entry was posted on Tuesday, January 24th, 2012 at 10:53	and tagged with nuts, pistachio, shortbread and posted in biscuit. You can follow any responses to this entry through the RSS 2.0 feed. Sitting with your brother in Cape Town and the little nephew, I am impressed! 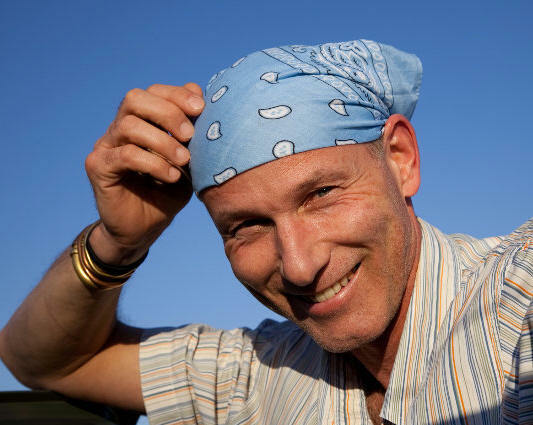 Hope the Sweaty Dutchman is too! Um so I’m saving up some money to either fly over to you or to have you fly here. So I can enjoy your beautiful cooking. Amazing g.